This Post has already been read 1010 times. The city of Mardan is located in Mardan District, a part of Khyber Pakhtunkhwa. It is the 19th largest city of Pakistan; highly influenced by Yousafzai tribe. Mardan is considered as a cultural spot, governed with traditions and rich history. Along with a great cultural legacy, Mardan is renowned for its splendor and breathtaking beauty as well. The residents of the city belong to different backgrounds and ethnicity but are extremely humble and hospitable. Over the years Mardan has witnessed an improvement in education and economic growth. It is an agricultural area and cultivates wheat, sugarcane, tobacco, maize, rice and mustard. We would suggest visiting Mardan during the winter season, as the summer gets quite hot. Takht-i-bahi is a 1st century archeological site, located in Mardan. These are the old ruins of the first Zoroastrian complex, which after the arrival of Buddhism were converted into a Buddhist monastic complex. Takht-i-Bahi consists of four main areas – stupa court, monastic chambers, temple complex and tantric meditation complex. It is highly recommended by archeologists due to its ancient Buddhist architecture. 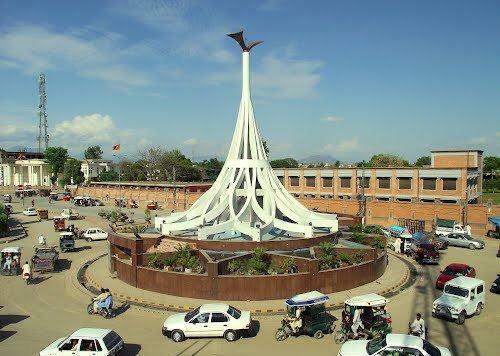 The Guides Memorial is situated in the center of Mardan city. It was built in 1892 in the memory of British soldiers, who sacrificed their lives in 1879 during the defense of the Queen’s residency in Kabul. It is a three storey picturesque structure with a central opening arch, staircases and cupolas. The memorial is secured with carved stonework and marble stones on the ground, which not only supports the building but also guards it from earthquake shockwaves. Bacha Khan Monument was built as a representative symbol of Pashtun culture. It is one of the contemporary constructions of the city, comprised of a rose petal like structure with lighted fountains. It is a sixty feet high memorial and very popular amongst locals and tourists. Mardan is popular for its traditional food delicacies. There are a number of restaurants in Mardan such as Baba Wali Restaurant, Shelton restaurant, Fish Huts and Sabdar restaurant. Popular foods of Mardan are chaplikabab, seekhkabab, tikkas and cholaywhich is served with tandoor baked bread. Shopping in the city is highly influenced with cultural fineness. You can find several small sized shops to enormous marketplaces around the city. Popular things to buy are traditionalashtun dresses, souvenirs, mazari cloth, chitrali woolen stuff, Sapley, Parhoone amongst many other items. Jovago Pakistan offers you a variety of affordable and luxurious hotels and guesthouses in or nearby Mardan. Visit Jovago.com for the best prices and your perfect stay will be just one click away!